Par Value $50. Dividends January & July. at this date, that Levi Baker, of Rehoboth, Mass. STOCK, which Shares are transferable only on the Books of the Bank. This certificate has a 25 cent United State Internal Revenue Certificate stamp, with the initials, "NWE" and the date, "Aug 23/66" across the face of the stamp. This certificate was difficult to price, as I have not been able to find any other one like it, over months of searching, so it is priced accordingly, at $1,800 (USD). Your credit or debit statement will reflect your payment made to "History Through Photos" and/or PayPal, depending upon how you establish your payment with PayPal. It will be shipped to the buyer, via USPS Certified Mail. Find great deals on eBay for antique stock certificate. Shop with confidence. Skip to main content. eBay Logo: ... Collectible Paper Ephemera (1900-1920) Collectible Railroad Stock Certificates & Bonds; ... ANTIQUE 1893 STOCK CERTIFICATE PENNOCK BATTERY ELECTRIC LIGHT TROLLEY TN SEAL MA. $299.99. Buy It Now +$7.99 shipping. VINTAGE EPHEMERA STOCK Certificate Tobacco Products Corporation Lot of 11 - $11.00. Lot of 11 stock certificates for Tobacco Products Corporation. One is a class A 5 share Certificate with trade stamps on the back. several smaller quantities and the large 100 share pueces are early releases. See the images for condition and details of the set. Welcome to Certificate Collector .com: I'm a Scripophily collector, that is, I collect antique stock and bond certificates. I also collect related books and ephemera. The items you'll see on this site are not for sale. 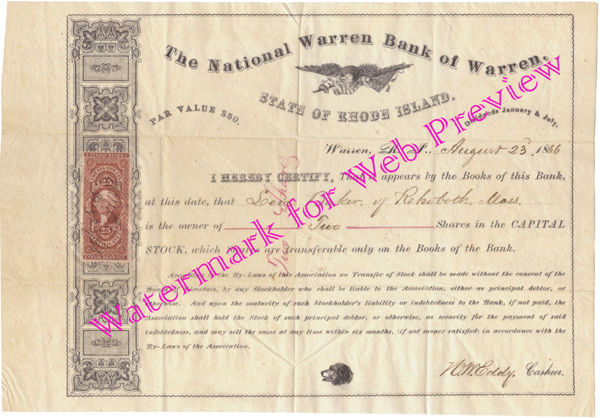 The term "scripophily," a hybrid of English and Greek, describes the collecting of original, cancelled stock and bond certificates. Coined in the late 1970s in response to a contest by the Financial Times of London to name the burgeoning hobby, scripophily was initially embraced by English and European collectors looking to purchase a piece of U.S. capitalist history. You searched for: stock certificates! Etsy is the home to thousands of handmade, vintage, and one-of-a-kind products and gifts related to your search. No matter what youâ€™re looking for or where you are in the world, our global marketplace of sellers can help you find unique and affordable options. Letâ€™s get started! A great resource for both novice and advanced collectors of old and antique stock and bond certificates. The certificates are listed by type with over 5,000 listings which include company name, whether issued or cancelled, date, state or country, vignette (the picture on the certificate), signatures, and value. How to Determine the Value of an Old Stock Certificate. Do you have stock certificates lying around that may have a value? Not sure where to go in order to find out? This article will show you what you can do to discover the value of that old certificate and how you can convert it into cash. I have created this webpage as a method to document and share the imagery of the vintage stock certificates in my collection of ephemera.